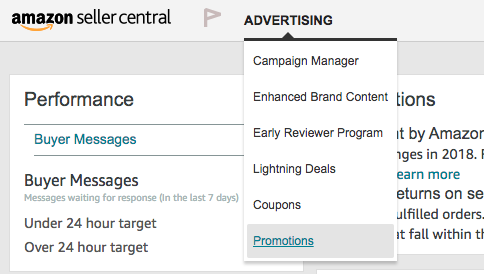 Learn how to create single-use promotion codes in Seller Central, download the codes and upload them for your landing pages. Sometimes multi use promo codes get posted on massive deal websites, and someone buys up all your discounted products. In this article, we’ll guide you through creating single use promo codes on Amazon So you can run discounts without being taken advantage of. 4a. keep ‘Buyer Purchases’ set to ‘At least this quantity of items’ and keep the quantity of items at 1. 4b. For ‘Purchased items’ select the product which you want to run the promotion for. 4c. In the “Buyer gets’ condition, put in the discount percentage you want to offer (Percent off in $ is no longer available). This will vary depending on your goals. Campaigns with higher discounts will likely result in higher conversion rates, although we’ve found that a drop-off occurs after 75%-off. And discounts of 50% + won’t be able to get Verified Purchase reviews. 4d. Leave ‘Applies to’ as ‘Purchased items’ and don’t worry about the Advanced Options. 5a. Choose a Start Date that is at least 4 hours in advance. Keep in mind that the time is set in Pacific time. And you may need to change the date if the current time is past 8:00 pm Pacific. 5b. Choose an End Date that lines up with when you want your promotion to end. Long enough to gain traction, but short enough to provide urgency. Something between 1 and 3 weeks from the Start Date usually works well. 5c. Give the ‘Internal Description’ a name that will help you keep track of the campaign. For example, including the product name & the discount percentage. 6b. Make sure that the box beside ‘One redemption per customer’ is checked. 8. Double check that the promotion is setup as you want it. 8b. Buyer gets the ‘Percent off’ that you planned to offer. 9. Click ‘Submit’ and a message that reads ‘Your promotion has been created’ should appear. 12. Then enter a Group Name. Use the same name you used for the Internal Description. 13. Enter the quantity of codes you wish to create. It should be enough to last the duration of your campaign. 14. Click ‘Create’ and the claim code group will begin processing. 16. If the Downloaded file is in .zip form, open and unzip it. 17. Otherwise, upload the file into your coupon delivery tool or save the file in a location you will remember for use later. Single-use promo codes are awesome, because it prevents one person from hogging up all your discounted items. But some Amazon sellers spend hours every week manually emailing single-use promo codes. Luckily, LandingCube automates the process of sending single-use Amazon promo codes. When a customer reaches your Amazon landing page and enters their email for the promo code, LandingCube will automatically send them a single-use promo code. And our tool is the industry leader in reliably delivering these promo codes! How to Upload Single-Use Promo Codes into Your Amazon Landing Page. 3. Build your landing page – fill in the Basics, craft your Design, and make sure to integrate your Email Service Provider. Then you’ll click Save & Continue to reach the Publish section. 4. On the Publish section of the landing page creator, simply upload the Promo Codes file you downloaded from Amazon. Click the ‘Choose File’ button and select the given file. We designed this Amazon landing page generator to make it as easy as possible to distribute single-use Amazon promo codes. All you need is your Amazon listing’s URL and the file of promo codes (which you just learned how to create). So you can grow your business by driving external traffic to Amazon - run promotions, boost your Amazon sales and rankings, and build email lists.